The U.S. Dept. of Energy is making up to $10 million available this year through the DOE’s Tribal Energy Program "to support the evaluation, development and deployment of energy efficiency and renewable energy projects on tribal lands that will help save energy and money, expand the use of renewable energy resources, and promote economic development for tribal communities." Arizona tribes have received support for a dozen projects since the mid-'90's. 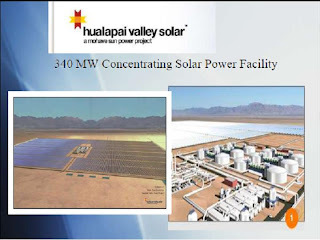 One is the Hualapai Valley Solar project in Mohave County [right]. Another renewable energy boost for Arizona with a major plant opening in Phoenix today. The news release by Power-One, the world’s second-largest manufacturer of solar power inverters for the renewable energy industry, announced that they opened "its first North American manufacturing facility in Phoenix that will eventually employ 350 people. Power-One’s Phoenix facility will produce its photovoltaic (PV) and wind inverters that convert renewable energy into a usable form of electricity for distribution on the utility grid. The facility will reach a capacity of 1 gigawatt of product by the end of the year with available site capacity reaching 4 gigawatts, which would generate enough electricity to power up to two million homes. The inverters manufactured at this facility will be installed in residential, commercial and utility settings." President Obama did not say the words "geothermal energy" explicitly in his State of the Union speech, but his intent could not be clearer. 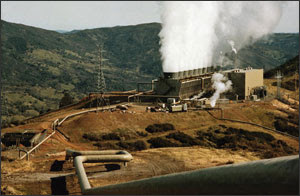 Geothermal runs 24/7, is one of the cleanest energy sources, is economically competitive already, and electricity is being produced at lower and lower temperatures. Beyond that, the use of geothermal for heating and cooling directly rather than production of electricity is still in its infancy. So, Mr. President, I accept your challenge and humbly suggest that geothermal energy is one of our greatest resource opportunities for meeting America's goals of clean domestic energy. "So tonight, I challenge you to join me in setting a new goal: by 2035, 80% of America’s electricity will come from clean energy sources. Some folks want wind and solar. Others want nuclear, clean coal, and natural gas. Now, clean energy breakthroughs will only translate into clean energy jobs if businesses know there will be a market for what they’re selling. So tonight, I challenge you to join me in setting a new goal: by 2035, 80% of America’s electricity will come from clean energy sources. Some folks want wind and solar. Others want nuclear, clean coal, and natural gas. To meet this goal, we will need them all – and I urge Democrats and Republicans to work together to make it happen." My long-time friend and colleague, Margie Chan, professor at the University of Utah, will be in town this week and is giving a talk at the Univ. of Arizona on Friday, entitled “Red Rock and Water on Earth and Mars.” The talk will take place on campus in Gould-Simpson Rm 209 at 12:30pm. Margie is a stratigrapher-sedimentologist, who has worked extensively in southern Utah. 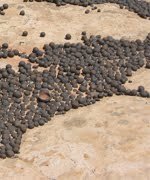 When the Mars Rovers landed and sent back photos of small "blueberry"-like concretions from the red planet, she immediately recognized them as identical to prolific "Moqui marbles" concretions formed by groundwater precipitation of hematite in Utah [right, credit Univ. of Utah]. Her work helped convince scientists of the existence, at least in the geologic past, of the importance of water on Mars. She tells a great story about the science and the thrill of discovery. She also introduced my wife and I to each other. "The National Astronomical Observatories of the Chinese Academy of Sciences (CAS) is negotiating with four world-class optical and infrared facilities in Chile and the United States to give Chinese astronomers around 50 nights of observing time per year at the telescopes," according to a post on ScienceInsider blog. As part of the $3 million, 3-year deal, the Chinese astronomers would get 10-12 nights per year of use of the 6.5 meter MMT on Mt. Hopkins in southern Arizona, as one of 4 observatories in the Telescope Access Program deal. 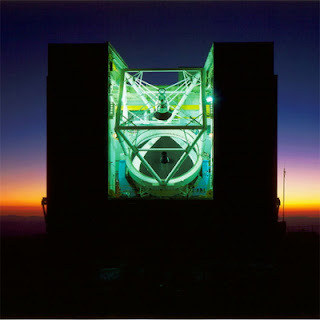 The Multi-Mirror Telescope is a joint venture between the Smithsonian Observatory and the Univ. of Arizona. "As part of the State of Nevada's reorganization efforts, the Mineral Resources budget account will be merged into the Division of Environmental Protection within the Department of Conservation and Natural Resources to take advantage of the unique skill sets and synergies that exist between the two agencies". This study began in the early 1980s with Steve Richard’s Master’s thesis (1982), continued with mapping the Little Harquahala Mountains (OFR 85-09), Granite Wash Mountains (OFR 89-04 and AZGS Map 30), Plomosa Mountains (OFR 93-9), and New Water Mountains (94-14). That work did not answer basic questions about the origin of the McCoy Mountains Formation, including its age (Upper Jurassic or Upper Cretaceous?) so we went after the geochemistry of the interbedded basalts (OFR-99-1). 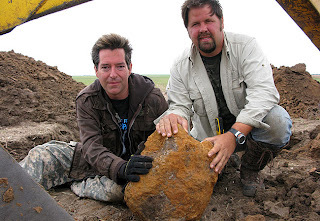 When detrital-zircon dating became affordable, Steve and I did a sample collecting trip in 2004. We even got a date on a basalt from samples collected on that trip, which, along with the detrital zircon data, solved the big problems of age and origin of the McCoy Mountains Formation. 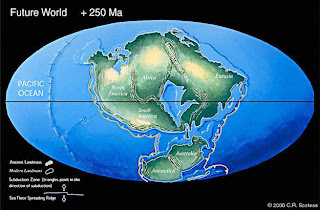 These new results led to the paper which looks at the breakup of the Pangea supercontinent, which consisted of all the earth's continent, by late in the Paleozoic Era (at about 250 Ma). "Africa separated from the eastern North America, and northern South America separated from southern North America. Arizona almost broke apart too in the late Jurassic (at about 155 Ma). At that time the McCoy Mountains Formation was first deposited in western Arizona (mostly La Paz County) and the Bisbee Group was deposited in southeastern Arizona. These two formations filled the rift valley that stopped rifting before southernmost Arizona was carried away by plate tectonic drift. 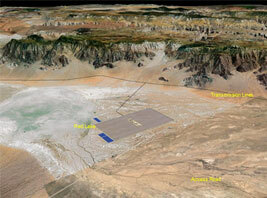 The new study identified distinctive geochemical characteristics of rift-related basalts in the McCoy Mountains Formation, reported the first geochronologic date on the basalt (154 Ma), and determined the basic sources of the sands that were shed into the basin. The Energy, Utility, & Environment Conference is "an annual energy, utility and environment conference where over 3,000 delegates including environmental business leaders, energy executives, NGO’s and government policymakers converge to collaborate on the various issues facing energy generation, the future of utility and its impact on the environment. Over a three day period more than 650 of the world’s leading experts will speak on the diverse topics of clean air policy, legislation and technologies, multi-pollutant control, energy and climate policy, wind, solar, EV-PHEV, carbon markets and CCS, corporate greenhouse gas (GHS) strategies, biofuels, biomass, and biogas, sustainability and reliability, energy efficiency and management, renewable energy and operations and management." The Arizona Republic reports that Maricopa County Flood Control District officials are looking at repairing or replacing a series of flood control dams in the East Valley over the next 15-20 years but earth fissures [left picture in figure at right. Credit, MCFCD] found near the Powerline flood retention structure [right map in figure at right] will necessitate a 'quick fix' construction of a new dam segment in the coming months. 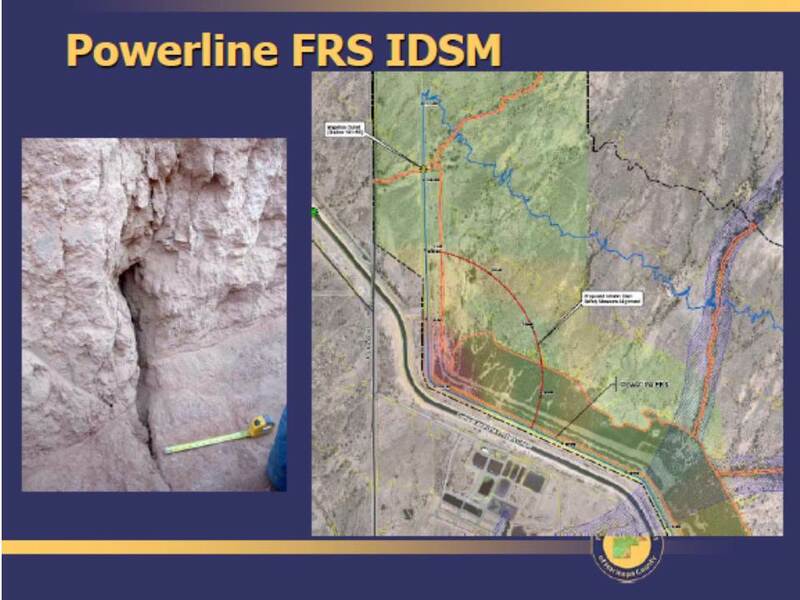 The District's website says the identification of the earth fissure at Powerline FRS led the Arizona Department of Water Resources to classify the dam as “unsafe, non-emergency, elevated risk.” The story says "District officials are hosting a public meeting Tuesday to provide information about the project and gather residents' opinions. The meeting, from 6 to 7:30 p.m., will be at the Phoenix-Mesa Gateway Airport administrative office, 5835 S. Sossaman Road, Mesa." 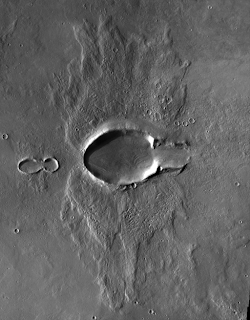 Mars "butterfly crater" formed by impacting moonlet? Emily at The Planetary Science Blog has created a mosaic of images from the ASU Mars Global Data website, showing an unusually elongated crater on Mars, probably formed by a very low angle oblique impact (ie, less than 10 degrees from horizontal). Emily makes the case that the impacting body was a tiny Martian moonlet that fragmented on entry in the atmosphere. The Tucson Gem, Mineral, and Fossil Showcase kicked off officially yesterday with tens of thousands of buyers and sellers filling the tent cities that have been erected all around town. But there are also a lot of fascinating lectures and other events going on during the two weeks leading up to the big Tucson Gem & Mineral Show at the Convention Center, Feb. 10-13. "...upwelling asthenosphere impinged on a strongly modified subcontinental lithospheric mantle, generating magmas that released gold-bearing fluids at depths of 10 to 12 km. The rising aqueous fluids with elevated hydrogen sulphide concentrations and a high ratio of gold to copper underwent phase changes and mixed with meteoric water. 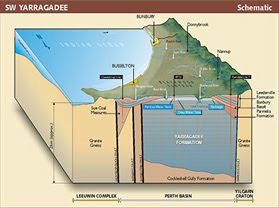 Within a few kilometres of the surface, the fluids dissolved and sulphidized carbonate wall rocks, leading to deposition of gold-bearing pyrite. 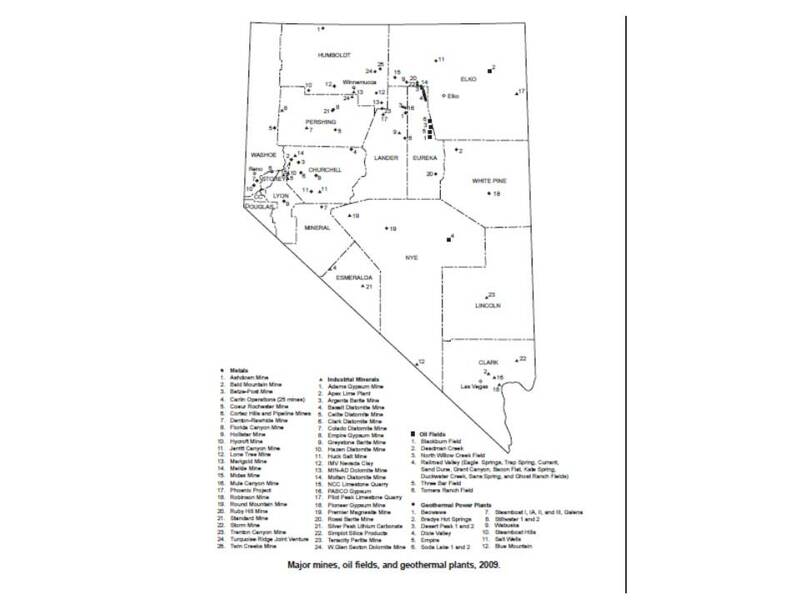 We conclude that the large number and size of Carlin-type deposits in Nevada is the result of an unusual convergence of a specific geologic setting, together with a tectonic trigger that led to extremely efficient transport and deposition of gold." HB2472, allowing for the taking of federal land under eminent domain. HB2313, another eminent domain, taking-of-federal-land bill. A similar effort was passed in Utah last year, although I have not compared that bill with the Arizona ones. The state funding to the mineral museum has stopped. So, the museum along with the museum board decided to raise an endowment through the sale of lower quality samples and duplicate samples from its collection of roughly 20,000 pieces. A request for proposals (RFP) was issued by the university, and Dr Marcus Origlieri won the bid to sell on consignment, with 90% return to the museum. His contract currently runs through the mineral show. The endowment was kick started by a $750K gift from Freeport-McMoRan, with the understanding that the museum would raise $3M total. The endowment is earmarked solely for the support of a collections manager position, currently held by Mark Candee, and operations of the museum. Our intent is to ensure funding for the mineral museum without destroying the collection. We will gladly accept donations. In addition, we currently have a total of $7M of minerals and funding in the form of estate gifts that are promised to the museum if it gets through this difficult time and shows that it is secure for the long term. The Winter issue of AGI's electronic magazine Geospectrum is online now. I am impressed with the range of news about the geosciences covered in the 47 pages. It's a valuable read. Kudos to AGI. GeoSpectrum is the free quarterly electronic newsletter of the geosciences. Originially launched as a newsletter for the American Geological Institute in 1995, GeoSpectrum has been reborn as the go-to source of information on AGI's 49 Member Societies. The American Geological Institute coordinates and edits the publication, but it is the result of contributed materials from socieities, geoscience organizations and others in the community. While this version is published quarterly, AGI also hosts a blog with the latest information on meetings, events, awards, and more. To access the blog please visit http://www.agiweb.org/geospectrum-blog/. All meetings are planned as an Open House scheduled to begin at 6pm, with an introduction and informational presentation from 6:30 to about 6:45, and scheduled to end at 8:30. The value of Arizona mineral production in 2010 was $6.7 billion, putting us in second place behind Nevada with $7.55 billion according to the USGS Mineral Commodities Summary 2011 released today. Arizona produced 10.46% of the nation's mineral value, while Nevada produced 11.70%. (construction), cement (portland), stone (crushed). 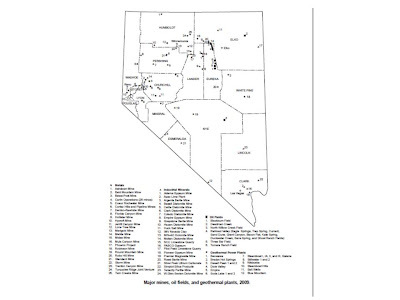 Nevada's lead over Arizona is attributable to the soaring price of gold. The MCS reports that copper and copper alloy products were used in building construction, 49%; electric and electronic products, 20%; transportation equipment, 12%; consumer and general products, 10%; and industrial machinery and equipment, 9%. The value of mineral production in the U.S. increased 9 percent in 2010 from that of 2009, suggesting that the nonfuel minerals industries, particularly metals, were beginning to recover from the economic recession that began in December 2007 and lasted well into 2009. The value of raw, nonfuel minerals mined in the U.S. was $64 billion in 2010, up from $59 billion in 2009, according to the U.S. Geological Survey’s annual release of mineral production statistics and summary of events and trends affecting domestic and global nonfuel minerals. "During the past year, we began to see increases in domestic mineral production, after significant declines in 2009," said USGS Mineral Resources Program Coordinator Kathleen Johnson. "This report allows for timely research and analysis of our nation’s minerals sector." The metals sector was marked by higher prices across the board and a substantial increase in tonnage of iron ore mined. The metals industries supported the overall gains in the minerals sector, offsetting a 6 percent decline in the value of non-metals in 2010. The non-metallic minerals sector continued to decline in 2010, but at a slower rate than in 2009. More non-metallic mineral commodities showed increases in mine production and value than those that decreased, but the production and consumption of dominant materials, particularly those used in construction, declined. U.S. dependence on foreign sources for minerals increased, continuing a trend that has been evident for more than 30 years. The U.S. relied on foreign sources to supply more than 50 percent of domestic consumption of 43 mineral commodities in 2010. The U.S. was 100 percent reliant on imports for 18 mineral commodities in 2010. Minerals are a fundamental component to the U.S. economy. Final products, such as cars and houses, produced by major U.S. industries using mineral materials made up about 13 percent (more than $2.1 trillion) of the 2010 gross domestic product. Domestic raw materials, along with domestically recycled materials, were used to process mineral materials worth $578 billion, such as aluminum, brick, copper, fertilizers, and steel. These products were, in turn, used to produce cars, houses, and other products. 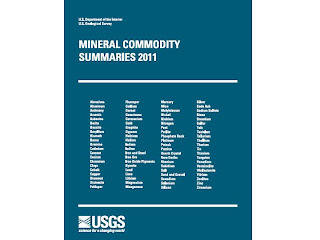 The report, Mineral Commodity Summaries 2011, is an annual report that includes statistics on about 90 mineral commodities and addresses events, trends, and issues in the domestic and international minerals industries. The report is used by public and private sector analysts regarding planning and decision making for government and business. FEMA officials are flying into Supai Village this morning to sign a formal agreement to implement federal disaster assistance to the Sovereign Tribal Nation of the Havasupai Tribe (Havasupai). This will release funds to assist the Havasupai with their recovery from flooding that occurred last October [right, photo by Brian Gootee, AZGS]. AZGS geologist Brian Gootee has been working with the Tribe to help with the recovery, including assisting with preparation during the past few weeks of a comprehensive mitigation plan that was completed just yesterday in cooperation with FEMA and the AZ Div. of Emergency Management. That was key to getting the disaster funds released. The famed Havasu Canyon has been closed to visitors since the flood but the emergency funds will be crucial in restoring tourist facilities that the are economic lifeblood of the Tribe. A Chandler high school senior, Scott Paul Boisvert from Basha High School, is one of 40 finalists nationwide in the Intel Science Talent Search. The finalists were selected from 300 Semifinalists and 1,744 total applicants and "will come to Washington, D.C. in March to participate in final judging, display their work to the public, meet with notable scientists, and compete for the top award of $100,000." The 40 finalists come from 15 states. The Intel Science Talent Search (Intel STS) is the nation’s most prestigious science research competition for high school seniors. Since 1942, first in partnership with Westinghouse and beginning in 1998 with Intel, SSP [Science for Society & the Public] has provided a national stage for the country's best and brightest young scientists to present original research to nationally recognized professional scientists. Boisevert's research project is titled, Influences of Environmental Chemistry on Growth and Chemotaxis of Batrachochytrium dendrobatidis in Aquatic Habitats: Implications for Amphibian Decline. It's too bad that a society that is glued to the tv to watch our kids on "American Idol," will largely ignore this collection of our best and brightest. Electric generation is one of the largest users of water yet many utilities do not even report what they use nor calculate the "opportunity cost" of water over the life of the plant, according to a new report from Western Resource Advocates, Every Drop Counts: Valuing the Water Used to Generate Electricity. 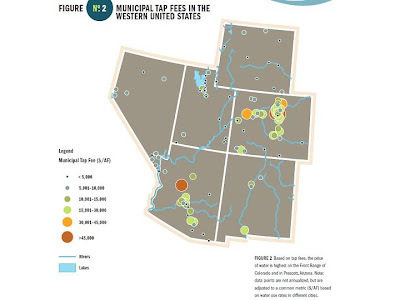 The report looks at water use in six western states, including Arizona. At a minimum, utilities across the region should report water consumption for existing facilities, along with projected water consumption for different proposed portfolios, as part of their integrated resource plans. In considering new water-intensive power plants, utilities and regulators should assess the value of water today, the potential value of water in the future, and the opportunity cost of using water for power generation over the lifetime of the power plant. Regulators and electric utilities should consider the benefits of maintaining flexibility, and the role of water-efficient forms of generation and energy efficiency as a hedge against short- or long-term drought. Arizona ranks 15th overall in a national comparison of states in science and technology, up two places from the last ranking in 2008. 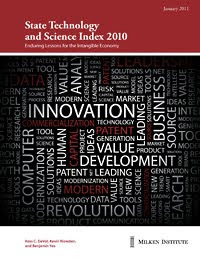 The Milken Institute report, 2010 State Technology and Science Index: Enduring Lessons for the Intangible Economy "looks at 79 unique indicators that are categorized into five major components: Research and Development Inputs, Risk Capital and Entrepreneurial Infrastructure, Human Capital Investment, Technology and Science Work Force, and Technology Concentration and Dynamism." Reporter Patrick O'Grady, writing at the Phoenix Business Blog says "Dragging the overall ranking down, however, is what Arizona has done in terms of educating workers that can supply technology jobs. The state ranked 32nd on the human capital investment scale." It's interesting to see that 3 of the top 5 states border Arizona. Freshman Arizona congressman Ben Quayle is newly appointed chair of the technology and innovation subcommittee of the House Science Committee. Gabrielle Giffords is also a member of the subcommittee. The subcommittee jurisdiction includes earthquake programs (except for NSF) and scientific issues related to environmental policy, including climate change. The U.S. Dept. of Energy has announced "the offer of a conditional commitment to Agua Caliente Solar, LLC for a loan guarantee of up to $967 million. The loan guarantee will support the construction of a 290-megawatt photovoltaic solar generating facility located in Yuma County, Arizona that will use thin film solar panels from [Tempe-based] First Solar, Inc. The project sponsor, NRG Solar, estimates the project will be the largest photovoltaic generation facility in the world when it is completed." First Solar says "when fully operational, the 290MW Agua Caliente Solar Project will generate enough clean solar energy to serve the needs of about 100,000 average homes per year, displacing approximately 220,000 metric tons of carbon dioxide (CO2) per year—the equivalent of taking about 40,000 cars off the road. Construction on the Agua Caliente Solar Project is planned to begin in late 2010. 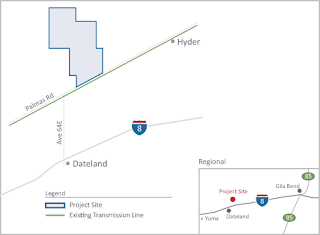 Pacific Gas & Electric Company has contracted to purchase the project's output for 25 years. " Last Friday, the Arizona Dept. of Mines & Mineral Resources shut down operations when they ran out of money. 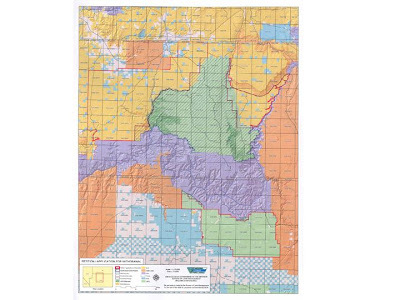 However, at the same time, the DMMR governing board transferred custody of the department’s files and physical resources to the Arizona Geological Survey for one year, or until the State Legislature acts on the Governor’s proposal to consolidate the two agencies or takes other action. AZGS committed to keeping the doors open to the ADMMR offices in Phoenix and public access to their extensive records, maps, and reports, at least through the end of the state fiscal year, June 30, pending the Legislature’s decision. DMMR Director Dr. Madan Singh officially retired on January 21, but graciously agreed to come back as needed to help in the transition and to finalize any outstanding reports. All the other DMMR staff accepted offers of employment with the AZGS at their current status and were transferred without interruption. AZGS did not assume the statutory duties of DMMR nor is this a merger of the agencies. DMMR continues to exist in statute and the Governing Board is responsible for the department assets and remaining funds. AZGS will report on our custodianship on a regular basis to the Board. 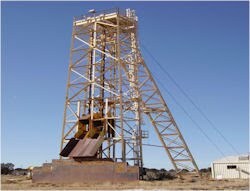 The statutory duties of the mines department and the geological survey are complementary and the Survey's mission is written broadly enough that we all feel we can continue to meet the needs of the citizens, agencies, and businesses of Arizona with regard to the mines department’s assets, both physical and intellectual. We are currently reviewing the external contracts and grants to DMMR to ensure we can complete the commitments made in them at which time we will request approval from the funding sources for us to manage them under the original terms. DMMR holds the state’s most extensive collection of historical and technical mine and mineral resource files, including many from now-defunct companies or personal libraries. They are irreplaceable. Yes, these files are invaluable to the small-mine operator as newspaper reports have emphasized, but they are also heavily used by other government agencies, by the bigger companies that have not worked in Arizona, and a variety of land owners, among others. DMMR works with the Arizona Corporation Commission and the Attorney General to provide them with solid engineering and economic evaluations on the issuance and sale of mining securities. Selling phony mining stock has been a favorite of scammers and con artists for years. DMMR’s customers are also other state and federal agencies, who need reliable information about mining projects across the state to understand the economic, planning, and environmental impacts that need to be dealt with. ADMMR, like AZGS, participates as a cooperating agency in numerous federal EIS processes, bringing their mining engineering expertise to bear. DMMR’s state funds would have run out at the end of January. With the state’s dire fiscal situation and severe budget cuts being imposed everywhere, an emergency budget increase for them was just not realistic. Instead, Gov. Brewer recognized that consolidating our two small agencies with complementary missions makes sense. We can preserve their critical records. Over the past three years, and in the midst of a nationwide recession, AZGS has grown at unprecedented rates due to our success in bringing in external funds to subsidize and underwrite our work on state issues that the state can no longer fully fund. We have a more stable funding base, greater infrastructure, and a support staff that we can bring to the consolidated agencies. The resulting economies of scale promises better service to you and our other customers and stakeholders at a lower cost. This consolidation has all occurred in just three days, so the dust won’t be settling for a while, but I am confident that we will come out with an agency that can better meet the needs of all our constituents, whether it’s a weekend miner or the world’s largest producers, as well as the range of federal land management agencies and environmental organizations. I expect you have questions or concerns about what this means. We’ll try to answer them the best we can but frankly, we’re breaking new ground here and we are still discovering, in some cases, just what the questions are. There are a lot of details that we continue to work out but the transfer overall was smooth and our combined operations are working as usual. I want to personally thank Madan Singh, the DMMR Board members, and the former DMMR staff for their selfless cooperation during this wrenching time for them. Gov. Jan Brewer has put her senior staff to work on this, along with the heads of the finance, administration, and personnel agencies, to make sure the transfer was completed almost overnight to preserve DMMR’s records and maintain continued access to them. AZGS is presenting two talks on new concepts in geothermal energy this Friday, Jan. 28 at our office in Tucson. We invite you to attend the talks on geothermal air conditioning and thermal profiles in wells. Dr. Frank Horowitz, from the Geothermal Centre of Excellence at the University of Western Australia in Perth, is stopping by AZGS on his way to the Stanford Geothermal Conference, and offered to give talks on aspects of his current work. At 10 am, Frank will talk on "Detailed thermal profiling of Perth Basin wells: a joint inversion for thermal conductivities and heat fluxes in active sedimentary aquifers"
At 2 pm he will present a more formal talk on "Geothermal air conditioning opportunities in hot sedimentary aquifers"
Both talks will be webcast nationally to participants in our DOE-funded State Geothermal Data project. 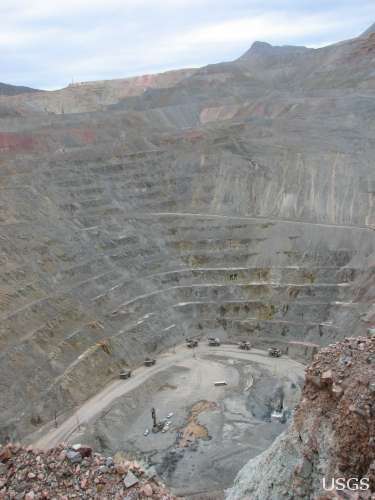 A United Steelworkers official says Asarco told the union last week at a meeting in Tucson that the company plans on expanding the Ray [right, credit USGS] and Mission copper mines, according a report by Platts, that has been picked up widely by the mining and financial news media. There are no responses from Asarco so far, except the company has posted the Platts release on their website, under the headline, "Asarco tells USW of plans to expand two copper mines in Arizona." That sounds like confirmation to me. There have been a few news reports about the consolidation of the Arizona Dept. of Mines & Mineral Resources into the Arizona Geological Survey last week, after ADMMR shut down because of lack of funds. I've posted comments or talked with the reporters at those publications. There's been some thoughtful comments back and forth about the developments. 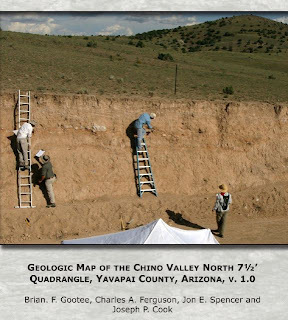 AZGS has released a map and report on the newly discovered “Little Chino fault” that borders the northeast margin of Chino Valley, north of Prescott. AZGS geologists are now studying the geochronology along the Little Chino fault and continue mapping in the Prescott-Paulden area as part of our work on the USGS funded Statemap cooperative program. 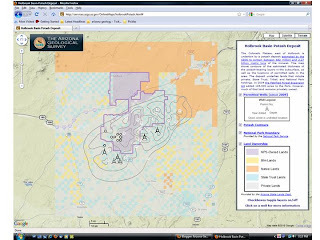 The map and report are available in PDF format at the Arizona Geological Survey Document Repository: http://repository.azgs.az.gov. 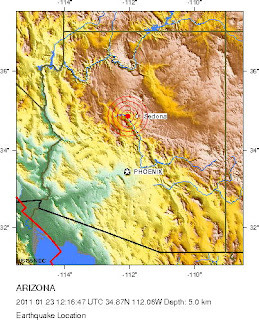 A magnitude 3.5 earthquake struck at 5:16 am local time this morning, about 15 miles west of Sedona, Arizona. There are only a couple reports of it being felt with weak to light groundshaking, no reports of damage. update, 1-27-11: the USGS has modified the quake size to 3.6 after reviewing the AZGS seismograph readings. The Arizona Dept. 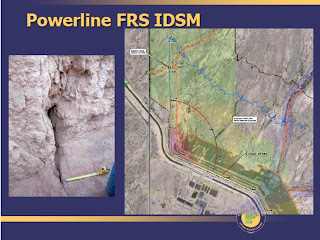 of Mines & Mineral Resources (ADMMR) and the Arizona Geological Survey (AZGS) finalized an agreement late this afternoon that turns over custody to AZGS of the ADMMR's extensive files and reports on mines and mineral resources. The ADMMR offices in Phoenix will open as usual on Monday morning, but under management of AZGS. We committed to keeping the ADMMR files open to the public through the end of the state fiscal year (June 30) or until the Legislature takes action on Gov. Brewer's proposal to consolidate ADMMR into AZGS. Five of the six ADMMR staff accepted offers to transfer to AZGS and will continue to work from their offices in Phoenix. ADMMR Director Dr. Madan Singh is retiring today. The entire staff had received notices of layoffs last Friday effective today, when ADMMR was projected to run out of money. ADMMR had been hoping for an emergency supplemental budget increase to continue operating through June but the states dire financial situation trumped that. When the Governor's budget was finalized last week, it became clear that ADMMR would not get the extra funds to stay open and would have a similar shortfall next fiscal year. The proposed consolidation of our two small agencies should also provide some efficiencies of scale, allowing us to provide better service to our customers and stakeholders at a lower cost. A lot of folks have been working almost around the clock the past few days to put together this agreement. I'll talk more later about how this complex deal was put together and what it means for Arizona. The Arizona Dept. of Mines & Mineral Resources (ADMMR) is running out of state operating funds and is being shut down on Friday. The Arizona Mining and Mineral Museum in Phoenix was transferred from ADMMR to the Arizona Historical Society last year to become the Arizona Centennial Museum. This left ADMMR with 3 state-funded and a couple of grant-funded positions. They moved out of the museum building into smaller space in nearby empty state offices. The department came to realize that their budget would not last through the year but it's now clear that the state's overall budget situation would not allow for supplemental state funding to carry them through until the new fiscal year in July. Gov. 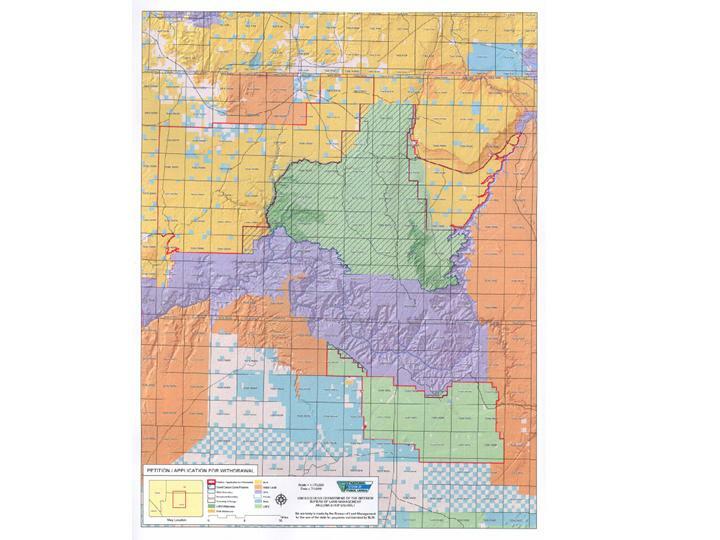 Brewer, in her budget released last Friday, proposed that ADMMR be consolidated with the Arizona Geological Survey. If that proposal is approved by the Legislature, it would probably not take effect until July 1. The immediate issue is to see what can be done between the closure at the end of the week and the pending consolidation. The Arizona (Flagstaff) Daily Sun ran a blistering story on the state's oversight of Denison Mines Arizona #1 uranium mine [right, head frame for Arizona #1. Credit, Denison Mines] saying it "has been largely left to regulate itself." The story appears to have been compiled from information in ADEQ files. However, no one from Denison or the AZ Dept. of Environmental Quality is quoted in the story. We need to hear their responses, but reporter Cyndy Cole has raised concerns that have to be addressed. There are proposals to develop 6 commercial solar power projects in Mohave County, ranging from 1 to 1,200 megawatts each, and totaling over 1830 MW. But none has broken ground and only one has approval from the Arizona Corporation Commission. Arizona's economy is about the same size as that of Thailand. The Economist magazine has published an updated map comparing the gross domestic product (GDP) of each U.S. state to that of other countries. Arizona's GDP in 2009 was $256.36 billion vs that of Thailand at $263.98. The interactive map lets you check out each state. "Here be dragons" - how is technology altering society and government? Arizona State University is a partner in Future Tense, along with the New America Foundation and Slate magazine. They are hosting a conference in Washington DC next month titled, "Here Be Dragons: Governing a Technologically Uncertain Future." Maps in the old days often included depictions of sea dragons or lions to connote unknown or dangerous terrain. Unfortunately, when it comes to a future that will be altered in unimaginable ways by emerging technologies, society and government cannot simply lay down a "Here Be Dragons" marker with a fanciful illustration to signal that most of us have no clue. How does a democratic society both nurture and regulate -- and find the right balance between those two imperatives -- fast-evolving technologies poised to radically alter life?" Planning is moving quickly for a 2012 Arizona Science and Technology Festival intended to rival the best such events in the nation. Jeremy Babendure, who was co-director of the hugely successful San Diego Science Festival, has moved to Arizona State University to set up a major event for Arizona. Jeremy told me that in just under two months they have met with over 50 organizations in industry, academia, the community and K12 and now have over 100 concepts in the works and likely 200 by the end of February. The first USA Science & Engineering Fair, held on the Capitol Mall in Washington, DC this past fall, was an incredible success [right] drawing 500,000 visitors to over 1,500 free ehibits. 2012 is Arizona's Centennial year which should provide an incentive to make our event special. World Premiere Conferences - Multiple world-class science conferences will be planned and draw visitors to Arizona during the Festival to experience the exciting events. EXPO Booths and Performances - highly visible exhibition providing engagement and exchange opportunities for children, teens, families, and local science professionals with dozens of hands-on activities, performances, interactive demos, science challenges, and family-oriented science entertainment.